Taiwanese researchers have managed to bar code some 16,000 of the 100,000 neurons in a fruit fly’s brain and to reconstruct the brain’s wiring map. 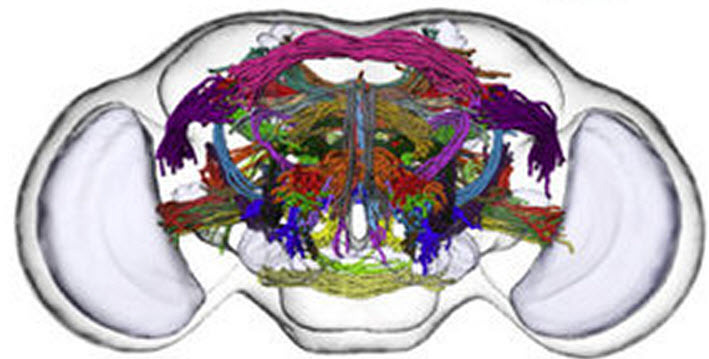 Biologists see this atlas of the fly brain as a first step toward understanding the human brain. The team describes the general architecture of the fly’s brain as composed of 41 local processing units, 58 tracts that link the units to other parts of the brain, and six hubs. Each neuron is given a bar code with the coordinates of where its cell nucleus lies within the standard Drosophila brain, as well as information about which other parts of the brain the neuron connects to, and which kind of chemical transmitter it uses. With 16,000 images in hand, Dr. Chiang’s team was able to analyze the general architecture of the female fruit fly’s brain. The fly brain, with its 100,000 neurons, may prove a better starting point for understanding the human brain, which has an estimated 100 billion neurons, each with about 1,000 synapses.